patch andi: Bring on a girl!! I know 3 pregnant women at the moment. One of them has to have a girl, right? Edit: 30/4/09 - First of the babies arrived today ...... boy! Better make a blue one just in case. The odds are with you on that one. How are you going to quilt this one? Love love love your blog!! VERY new to this and wanted to ask some questions re some of your beautiful quilts. Is that ok? Re all the pink, was so sure i was having a boy 1st time round had 6 boys names, yep you guessed it, a girl. Maybe a quick blue one, just in case!! This quilting thing is so addictive!!! Night. Love the pink and what a nice idea for a jelly roll! 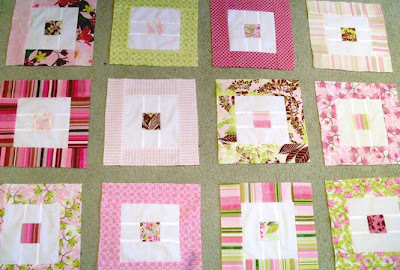 Love the quilts you have been making. I am about to start sewing one too - hope mine turns up half as good as yours! beautiful! i'm sure this will make someone very happy. thanks for the nice comment on my blog! Oh it's beautiful! You can always enlarge it and keep it for yourself! Adorable quilt design. I might have to keep this idea in my head for another quilt sometime. It is quite adorable. That will be one lucky little girl. Your blocks are wonderful! That's going to be one lucky baby girl! Lovely quilt! Thanks for all your nice comments on my quilt blog. I am a totally overwhelmed by how welcome I have been made to feel in blogland! I love these colors and this pattern is always a favorite. Oh, surely one girl! It's gorgeous! Chances are!!!! 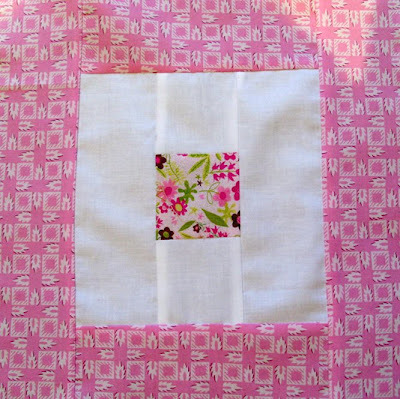 Everyone I know is having girls at the moment =] A very cute quilt indeed!!!! Love the colours, give the little boy a big hug. have a great weekend. did you mind emailing me you details for the mail swap. if i pretended to be pregnant? would you send me that quilt? i swear i'm an awesome individual! I love your quilts. I've just linked over to you from Loobylu's latest post and I'm hooked. Myself, I'm just learning the craft of craft and I'm loving it. Started with knitting and now I'm moving onto learning to crochet (while I continue the knitting adventures). Quilting... i love. I wish I'd done something like this for my little boy. I love the colors and fabric combination of your baby quilt! That will be one lucky babe! !